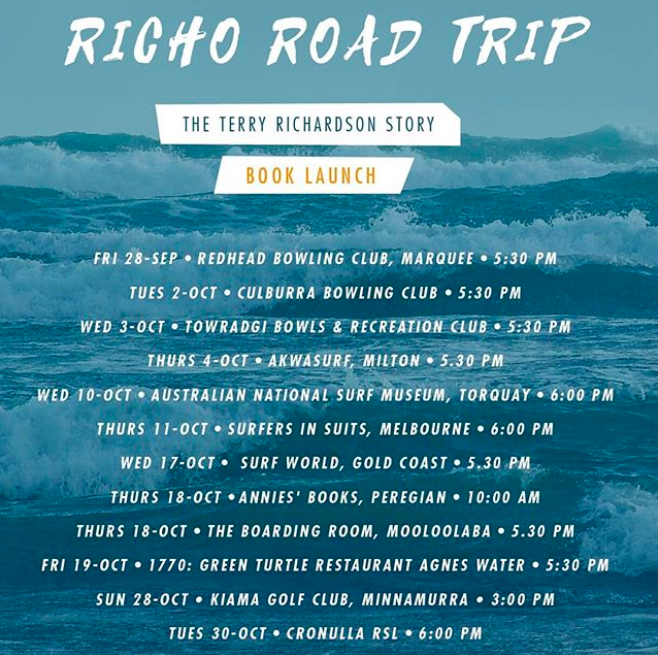 In a week's time Terry Richardson - ex-World Number 7 and the People's Champ of Wollongong - was due to launch his autobiography. It was to be a big moment, as you'd expect, the book covers his glittering career and has contributions ranging from Lopez to Lynch. 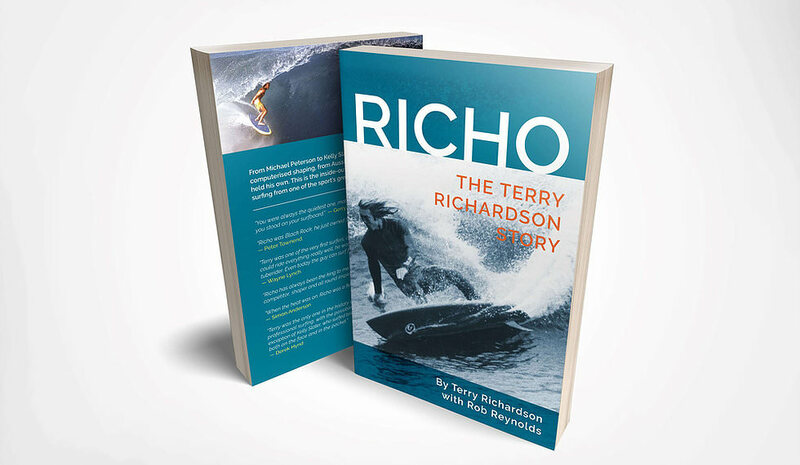 Yet ever the competition nut, Richo got a last-minute call up to the World Masters Championships in the Azores, postponed the talks and got to training. 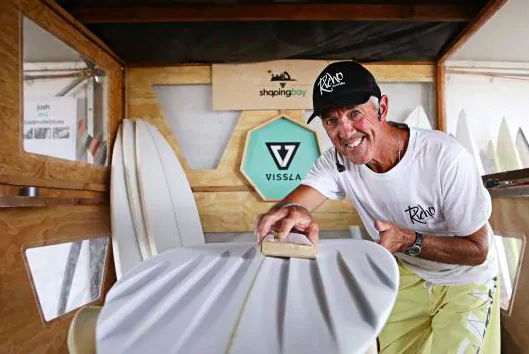 After a session at the local, including more fine-tuning of his self-shaped quiver, Richo knocked on my door and we sat down to talk about being a competitive grandfather who just can't quit. Swellnet: So you got the call up to the World Masters in the Azores. You were first alternate, is that correct? Richo: Yeah, that's what Alan Hunt told me. You're an alternate, yet you've won the Masters before? How's that work..? When I won in Fiji in '97, I was told that once you win you'll be invited every year, no matter what. So I was a bit dumbfounded to hear that I was an alternate. Did they forget or something? I think they were trying to do what Randy Rarick told me in Brazil in 1981. "This is for the good of Brazilian surfing". They quietly pushed me out to first alternate and put a Brazilian guy in, so they have that flavor in there. For the good of Brazilian surfing, once again. Perhaps they thought that you retired, considering you've given a few indications. I think you retired from the Masters in '97, didn't you? Then you retired again in 2003. Perhaps you've said it a lot? [laughs] Yeah, well I try and get it in me head that I'm gonna retire and then me kids and everyone always tell me, "You only get one shot, make the most of it." And I was brought up that way. You get a shot, grab it by the horns and go with it, you know? Well you're making the moment last. I'll give you that. Yeah. But this one is a cherished moment for me because I was retired, really. Really. What happened was, I thought I was in, so I trained all first half of this year and even went to the Maldives purposely to get ready for it. And I came back to find out I was an alternate, so I retired. I was all bummed and got into doing me book launches to forget about it all. I'd done hardly any surfing or training after that and then all of a sudden I get called up two weeks before the event's on. So now you're surfing two and three times a day every day to get ready. Yeah, just to try and catch up, and then when I've caught up I'll just mellow out and slowly psyche up through the event. Do you surf in board riders comps anymore? No, it's not that often. So how do you hone your competitive skills? Good question, that. Whenever I go surfing I run through the motions and have a little repertoire I stick to. And if I stumble or falter I think, "Oh, I'm a bit rusty." So I try and surf a bit more and then when I think I'm hitting my straps I'll sort of go, "Okay, I'm right now. I can back off and just go fishing for a while or go and see the grandkids and chill out for a while". That sounds like a good way to balance it. Yeah, I try and stay fit in general. Do some yoga and be there for the grandkids, try and be an ambassador for the younger kids to look up to. You know, "He's at a certain age. Maybe we can do that at that age if we do what he's doing," you know? It's good to try and pass things down to the younger generation. Good on you. Now I saw you at the Point recently with a whole quiver of boards. You're taking self-shaped equipment over to the Azores. Have you finalised what shapes you're taking? I've got them down to me favorite little 5'11 shape and 6'3 shape and me favorite 6'7 I use at Pipe, so that's coming for sure. With the 5'11 I made the mistake of making someone exactly what I'd like to do next. And fortunately for me, and unfortunately for him, it turned out really light with this glass and I said to him, "If I knew it was gonna be this nice I would have put it up on the rack and done you another one." And the guy, being such an awesome person, said "Well, why don't you ride it and if you love it, take it. And if you don't I'll just grab it and it's my board." So I thought, "Wow, how many times do you get to do this?" So I'm gonna ride it later on today and I think it's gonna come in really handy. I've been loving me small boards lately, so it might be just the thing I need. There are nine guys in your division, were any of them a bogeyman during your career? Where any of them hard to beat? I don't think I've ever surfed against Ratso [Iain Buchanan]. He's the current World Champion. From what I've seen of him, he's gonna be really hard to beat. Shaun [Tomson] was on fire in Brazil and Ratso beat him, so they're two pretty tough characters and Michael Ho's always on fire. So that's three toughies and then you got Simon Anderson who, depending on the waves, can still surf unbelievable. Then you got Cheyne Horan and then you got Hans Hedemann. I'm trying to think who else...Glen Winton! Mr. X. He's a force to be reckoned with every time. You just gotta be lucky when he falls. You reckon Glen Winton will be wearing his webbed gloves? If he's keen on winning he might be. And you'll be wearing yours? I'll be wearing mine for sure. OK, in a day or so, the Surf Ranch Pro begins. Have you got much of an opinion on Kelly's wave pool? It looks great. I have seen it on TV, and I was even planning to go there and internationally launch my book, but once I got the call up to the Masters I bailed out on that. As it is, I've given Barton and Joe the first two copies. And I got me fingers crossed that they're gonna do a little: "What are you up to, Barton?" "Oh, I'm just reading Richo's autobiography." Speaking of, your other book launches have been tossed aside because of the Masters call up. What's gonna happen now? They've just been put back two weeks. Most of them have been put back two weeks. I get back for the last few so they're still on. But the ones when I'm away, they're just gonna be rescheduled from there on. So the boys in the background have been doing that and they're doing a great job. Have you had much feedback about it yet? No, just people saying "I paid for me book, where is it?" [laughs] And I'm just telling all these people, it's in the country, it's coming! It's really exciting. It's not a pain, it's just hard to deal with. I just hope it all comes off as good as it looks. Well during the book launches there'll be plenty of stories from your pro career, hopefully there'll be another more recent story to tell. Aw, it's just a treat to be invited to the Masters. It starts on me birthday. I'll be 63 the day it starts. Here's wishing you the best. I'll definitely go and give it a shake. i reckon i'd much rather watch the masters comp than a wave pool comp any day. Don't forget to sign my book Richo, I prepaid mine ages ago. Just got my copy Zen. Saw your name in the back of the book. Cheers Stu, now i can tell everybody i've been published. I know it's an interview Stu, but I think you have some editorial freedom to correct Richo's pidgin. Nah, I liked it. I was hoping it might help place the reader in the company of Richo, who may have skipped elocution lessons but double-dipped in so many other areas, especially joy de veev. And the editorial freedom to maintain accuracy and portray Richo’s personality that is partly conveyed through his language. One of the greats of his generation - graceful and fluid. I really wish Terry well with his book launches and sales. He's definitely there. He had a narrow loss to Hans Hedemann yesterday and surfs against Cheyne today. Interesting comment about wearing webbed gloves. I'm sure they are functional, but surprised that they would be allowed to use them in a competition? I recall seeing them marketed years ago but have never seen anyone wear them. Seems a bit like wearing wrap around watersport sunglasses in the surf - functional for physical or medical reasons, but I'm guessing the mass take up of webbed "paddle power" gloves in the line up never took off as its dare I say it a bit uncool? I'm interested to hear any feedback from anyone who has used them? If they increase your paddle power by say 25% maybe I'll go out and buy a pair! I used them when they 1st came out, they def improved your paddling power but the effort required resulted in shorter sessions, bit like using a bigger blade on an oar, moves more water but more energy required to move it. as they say "No such thing as a free lunch". Webbed Gloves are supposed to destroy Shoulders according to physios. Thanks Udo. Given the state of my left shoulder best I avoid then . I see Stunet posted a good article titled 'Bringing back webbed gloves" on 2/2/16.